I’m excited to say that I took this photo in my backyard yesterday. 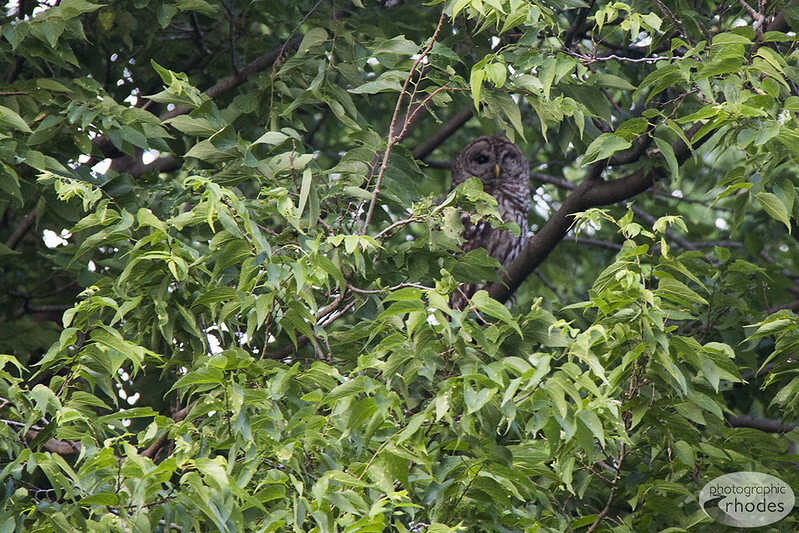 I live in a suburb of Kansas City, so seeing an owl in my yard isn’t exactly a common occurrence. I heard a ton of birds making all kinds of squawking noises yesterday evening, so I looked outside to see what was going on, and this large owl was starring right at me. I grabbed my camera and took a couple of quick distance shots, then walked closer only to get few blurry shots before she flew off. Coolest nature experience so far since we moved in March! Does it look like she’s is blinking in this photo? Looks like she’s winking at you! The other evening at dusk a little screech owl landed on one of my plant hooks near our patio. I was so bummed because it was too dark to get a photo. I’ve been waiting to actually see an owl after hearing them around our yard for several years now. How lucky you are!!! They are sneaky, aren’t they? I guess it probably was odd that he/she was out during the day. Although many believe that owls are a bad omen…quite the contrary is true…expect to see something of great importance news coming to you. Believe it ! Be happy you don’t have dogs. Presley and Gracie bark incessantly at the owl who used to frequent the pine tree in my backyard.